Norman Van Aken at CIA-Worlds of Flavor 2009. Photo by Gerry Dawes©2009. Norman Van Aken is known as “the founding father of New World Cuisine.” He is the only Floridian inducted into the James Beard “Who’s Who.” His restaurant, Norman’s, was deemed Best Restaurant in Florida by The New York Times and was also nominated by the James Beard Foundation as The Best Restaurant in America in its first year of eligibility. Chef Van Aken was hailed as a “culinary genius” by Johnson and Wales University and given an honorary doctorate. In 2006 he was honored as one of the Founders of the New American Cuisine, alongside Alice Waters, Paul Prudhomme, and Mark Miller at Spain’s International Summit of Gastronomy Madrid Fusion event. Check Norman's report from CIA-WOF. Janet Van Aken, also one of the true greats. Photo by Gerry Dawes©2009. Bobby Chinn is the owner and chef of the highly acclaimed Restaurant Bobby Chinn in Hanoi, Vietnam. Bobby is a French-trained, New Zealand-born, former San Francisco-based chef of Egyptian and Chinese heritage who brings a world of influences to his kitchen. During his first visit to Vietnam a decade ago, Chinn saw the un-mined potential for culinary growth in a country where tourism was still in its infancy. His menus are always market-driven, inspired by the freshest seasonally available ingredients and exclusively organic produce. Chinn now has two cooking shows on Discovery Travel & Living, and he is the author of the best selling cook book Wild, Wild East: Recipes & Stories from Vietnam. Photo by Gerry Dawes©2009. Paul Bartolotta, Ristorante di Mare, Wynn Las Vegas, one of the great seafood experts in America. He flies in tons of seafood every week. Here he is shown preparing a sea bass covered with sea salt flavored with fennel, anise, strips of lemon and orange. What an aroma! In addition, he made may day with a tasting of Dublin Bay prawns. My kind of guy! Photos by Gerry Dawes©2009. Mai Pham is the chef/owner of Lemon Grass Restaurant and Lemon Grass Asian Grill and Noodle Bar in Sacramento, and at the Sacramento International Airport - the first Vietnamese Thai concept located inside an airport in the U.S. She is the author of Pleasures of the Vietnamese Table, The Best of Vietnamese and Thai Cooking, and the just released The Flavors of Asia. A food columnist for The San Francisco Chronicle and host of the Food Network special My Country, My Kitchen: Vietnam, Chef Pham is the winner of the IACP Bert Greene Award for distinguished journalism. A frequent guest instructor at the CIA, Chef Pham consults with colleges and universities (she recently launched Star Ginger at UC Berkeley) and is the creator of Lemon Grass Kitchen, a line of Asian soups and sauces for foodservice. Her new retail collection was recently launched at Whole Foods and other grocery chains. Chef Pham is a member of the CIA¹s Asian Cuisines Advisory Council. Photo by Gerry Dawes©2009. Two Girls From Brooklyn in the Kitchens of CIA-Greystone. Joyce Goldstein & Paul Wolfert. Google them if you do not know these two legendary cook-authors. Maricel Presilla is a culinary historian, author, and chef specializing in the cuisines of Latin America and Spain. Ms. Presilla is the co-owner and chef of Zafra and Cucharamama, two Latin American restaurants in Hoboken, NJ. She has been nominated for Best Chef, Mid-Atlantic Region by the James Beard Foundation in 2007, 2008, and 2009. Her outdoor cooking, inspired by the street and comfort foods of Latin America, was featured in a 26-page spread in Gourmet in June 2009, the first time the magazine has dedicated so much space to a menu story covered in real time without props or stylists involved. Ms. Presilla is the author of The New Taste of Chocolate: A Cultural and Natural History of Cacao with Recipes (Ten Speed Press, 2009) and a Latin American cookbook for W.W. Norton that explores the cuisines of 20 Latin American countries (forthcoming). In November 2009, she will open Ultramarinos, a food store and cooking atelier in Hoboken specializing in Spanish and Latin American foods and ingredients such as cacao and chocolate. She divides her time between her New Jersey restaurants, Miami, and Latin America. Photo by Gerry Dawes©2009. Paula Wolfert and Mark Miller, both legends. Photo by Gerry Dawes©2009. 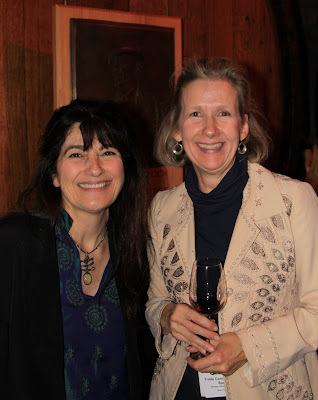 Ruth Reichl and Katrin Naelapaa, Director, Wines From Spain. Photo by Gerry Dawes©2009. Ana Celia Batista Santos from Zanzibar Restaurant in Salvador Bahia, Brazil. Cooking up an African inspired dish in the CIA-kitchens during Worlds of Flavor. Ana Celia Batista Santos is chef-owner of Zanzíbar, a bar and restaurant that specializes in African and Afro-Brazilian cuisine. Chef Santos was born and raised in Salvador, Bahia, a region in northeast Brazil known for great culinary diversity, especially African-influenced cuisines. She began cooking at an early age by helping her aunt, the head cook, at the Bahia Hotel. Before opening Zanzibar, Chef Santos cooked for 10 years at the Afro-Brazilian restaurant Casa Do Benin, where she developed her well-known cuisine that adapts African flavors to the tastes of the Bahian diner. Zanzibar opened in 1976 and quickly became a popular hangout for local bohemians, poets, and musicians like Caetano Veloso and Gilberto Gil, who have mentioned the restaurant in their songs. Through her cooking, Chef Santos presents great Afro-Bahian cookery with lots of flavors and rhythm.